Groundnut mutants TG-8, TG-9, TG-17 and TG-18 induced by γ-irradiation differed in fatty acid composition from their parent Spanish Improved. All the mutants had lower linoleic and higher oleic than Spanish Improved. TG-18 had lower oleic and higher linoleic as compared with TG-8, TG-9 and TG-17. Palmitic acid in TG-18 and Spanish Improved was higher than other mutants. Oil stability as judged by oleic to linoleic ratio was substantially higher for mutants as compared with their parent. Amino acid composition of groundnut mutant proteins differed from Spanish Improved. In general mutants had higher contents of lysine, histidine, proline, phenylalanine and tryptophan and lower contents of threonine, serine and methionine. The first limiting amino acid was tryptophan in Spanish Improved, threonine in TG-8, TG-9 and TG-17 and Valine in TG-18. 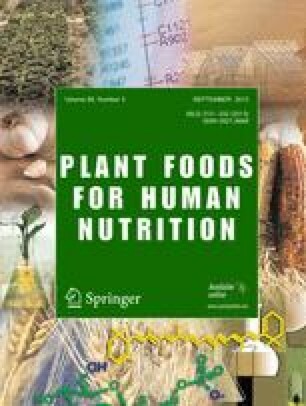 Essential amino acid contents for all except methionine, valine and threonine per grain flour were higher in all the mutants as compared with their parent.